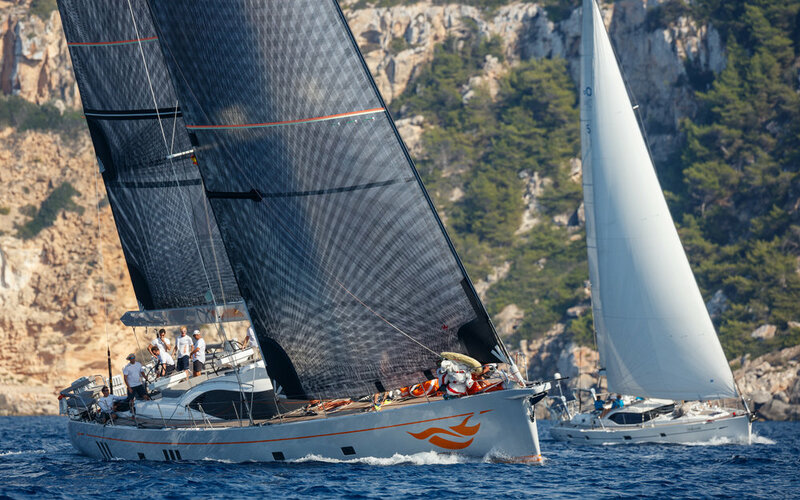 The team thoroughly enjoyed another weeks racing, this time with Oyster Yachts at Real Club Nautico in Palma. Day 2 of racing would prove to be one of the most memorable days sailing in the team’s year with no doubt that the words “do you remember the day when the hydraulics packed up?” would remain in the team’s vocabulary for years to come. A hydraulic leak due to a burst hose within the first 20 minutes of racing meant the team were faced with sailing the boat manually, with no winches, and a firm resolve of “until we find the boat unsailable, we will sail”. Sailing one manoeuvre at a time, the creativity flowed in order to keep Firebird moving. Can we furl the zero? Can we sheet the jib? Can we sheet on the main? Bit by bit it happened, the team gelling together. It was also a tricky day tactically with the wind shifting 30 degrees throughout the race. It was a good example of heads-up navigating and we made good calls on lay lines despite expedition and the technical equipment saying otherwise. The team achieved second place with only 1 minute separating ourselves and Guardian Angel 885-03 a remarkable feat considering we sailed a 73 tonne boat manually. The teams efforts were rewarded with first place on the final day of sailing and proudly picked up second overall in Class 1.